"From Deportation to Cyprus (June 1946) to Operation 'P'dut' (February 1949)", "Photo-Studio L. Kougel, Haifa", photo album. [ca. 1949-1950]. Album with approx. 190 photographs (pasted to album's leaves), documenting the various stages in the "Cyprus Deportation": arrival of illegal immigrant ships from Europe to Palestine, arrest of immigrants and immigrants boarding the deportation ships, Cyprus and Atlit detention camps, and finally – operation "P'dut" – the transport of immigrants to Israel after the State of Israel was established. 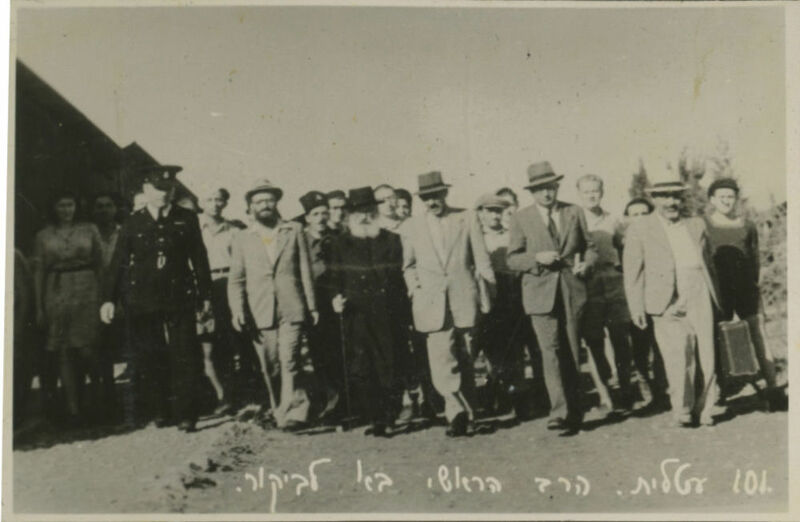 The photographs portray, among others: Immigrants taken down from the ships Tel-Hai, Anzo Sireni, Henrietta Szold, Yagur, Bracha Fuld, Knesset Israel, Latroun, Haim Arlozoroff, Theodor Herzl, Shear Yashuv, Yetziat Europa 1947, Haganah, Birya, Palmach, Moledet, Haviva Reik, and other ships. • Life in Atlit detention camp – sewing course, babies ward, "Bikur Holim", and more. • Life in Cyprus detention camps – barracks in winter camps, dwelling tents, handicrafts of detainees, day of opening the gates and more. • Photographs of the last deportees arriving to Israel during Operation "P'dut", in January-February 1949 (on board of the ships Galila and Atzmaut). • and more. The album is in its original binding; on the front appears the title in handwriting surrounded by a drawing of the Mediterranean basin, with Cyprus and Israel. Enclosed: official envelope of Photo-Studio Kougel. Photographs: approx. 8.5X6 cm. Album: 29X20.5 cm. Good overall condition. Some blemishes, creases and stains to photographs. Some tears and blemishes to margins of leaves. Tears to binding and spine (restored spine). Rear binding is detached. New tissue guards.